TS RC 330 Guidelines fotr Appointment of Acadamic Instructors . 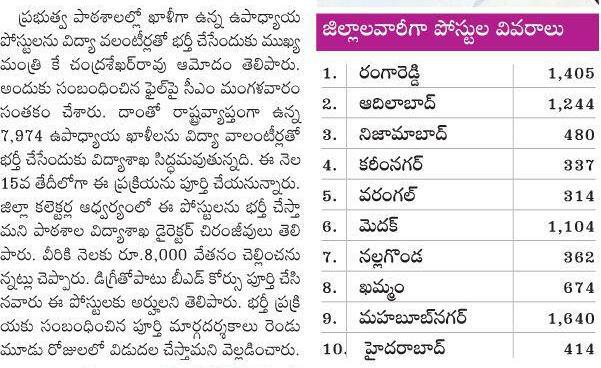 Telangana Government Order Issued Appointment of Acadamic Instuctors / Vidya Volunteers in All Schools in Telangana. 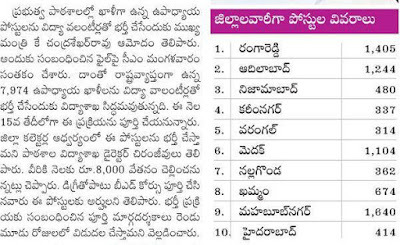 After Teachers Transfers and Rationlization Not fillup Transfer vacacies post in Schools appointment Acadamic Instructors. Acadamic Instructors Appointment in Primary Schools , UP Schools and High School as per Rationalization Norms and Rules. GO MS No 11 Date. 15-06-2015, GO MS No 17 Date. 27-06-2015. 1. Norms Prepare as per GO MS No 11 Date. 15-06-2015, GO MS No 17 Date. 27-06-2015. 4.Restrict the requirement of Vidhya Volunteers / Acadamic Instructorsa to extent of sanctioned strength only.